From the house of Lakme Absolute brings to you the revolutionary new gloss with incredible shine of gloss and one stroke application of a lipstick. Get addicted to great Color and glossy lips! The Lakme Absolute Gloss Addict brings you the best of both worlds - Incredible hi-shine of a liquid lip gloss & one stroke application of smooth lipstick. Created by Lakme?s backstage experts, these trendy shades will change the way you look at lip color! Lakme is India's leading cosmetics brand offering a wide range of high-end, world-class color cosmetics and skincare products. Lakme has a vast product range specially crafted by experts for the Indian skin. The brand Lakme has also been redefining fashion in India for over 15 years with Lakme Fashion Week, India's premier fashion event. 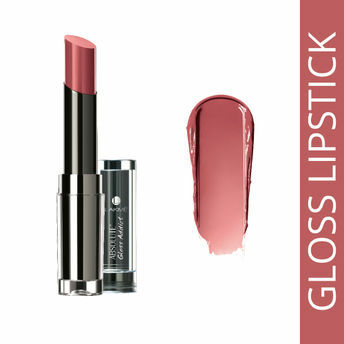 For runway ready lips, try the Flaming Gloss shade from the Lakme Absolute Lipstick range. Explore the entire range of Lip Gloss available on Nykaa. Shop more Lakme products here.You can browse through the complete world of Lakme Lip Gloss .Alternatively, you can also find many more products from the Lakme Absolute Gloss Addict range.